2014 Can-Am Commander DPS 800, 2014 Can-Am® Commander 800R DPS Get the flexibility to customize your machine the way you want it, with the control of the Tri-Mode Dynamic Power Steering (DPS ). STANDARD FEATURES MAY INCLUDE: INDUSTRY-LEADING PERFORMANCE Hitting the trail, going hunting, or just taking in nature, there s a Rotax® engine that will get the job done. Choose from the 71-hp Rotax® 800R or the 82-hp Rotax® 1000 liquid-cooled V-Twin engine to match your off-road adventure. CATEGORY-LEADING PERFORMANCE Available in a 71-hp Rotax 800R or 82-hp Rotax 1000 liquid-cooled V-Twin engines, with four valves per cylinder and single overhead camshafts. Both feature twin fuel injectors that supply efficient fuel delivery into the combustion chamber for powerful, yet precise performance. BETTER THROTTLE CONTROL This electronic throttle-by-wire system works in conjunction with the 2.13 in. Bosch8 throttle body to produce smooth delivery, even if the driver's foot is bouncing due to rough terrain. The iTC system detects unwanted bounces and filters the input. Comes with a progressive and sport mode. STRONG POWER OUTPUT This package provides a more powerful magneto with 625 W of power output. ELIMINATES SCRUB AND CAMBER CHANGES The only independent rear suspension that eliminates scrub and camber changes, meaning the wheels pivot up and down rather than in a butterfly motion. This ensures the vehicle moves only in the direction you point it. Reconfigured for improved traction and optimal transfer of power to the ground. 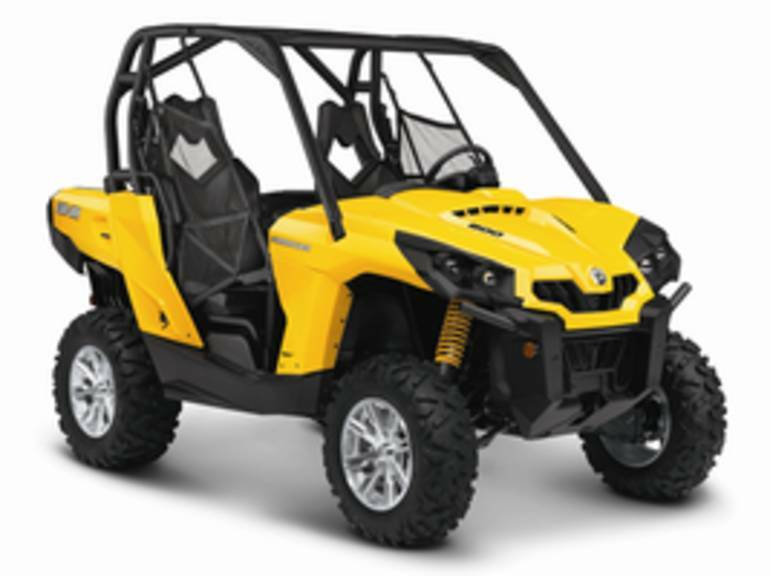 BETTER STEERING FEEL The Can-Am Commander's Double A-arm front suspension is designed with dive-control geometry that works to eliminate diving under heavy breaking and rough terrain. The front end features 10 in of travel and five-way preload-adjustable motion-control shocks. RIDER-FOCUSED DESIGN Put the Commander to work towing heavy loads up to 1,500 lb. Plus, the added convenience of strategically placed passenger handgrips, accessible controls, and cockpit storage, and you re ready to hit the trails or get to work. EXCLUSIVE AND VERSATILE The industry s most versatile and usable cargo box design has a 600-lb cargo capacity, dual storage levels, anti-rust box, and tilt-assist dumping. Cargo box with two levels separated by a removable, water-resistant panel, that offers an upper and lower bed with their independent tailgate. CONVENIENT STORAGE The onboard storage consists of a 4.5 gal (17.2 L) glove box and a 3.4 (13.1 L) storage space beneath the driver s seat. Convenient and versatile cockpit storage space so you can take your essentials with you. All Can-Am pictures are kind of Can-Am HD motorcycles picture was taken, including motor fuel gauge, engine, engine mounts, tires, fuel tank, the car handles, lights and so on, 2014 Can-Am Commander DPS 800 UTV/Utility full-screen viewing,2014 Can-Am Motorcycles today Price: $11,579.